Armstrong, M. A.; Basic Topology, Springer; 1st edition (May 1, 1997). ISBN 0-387-90839-0. Bredon, Glen E., Topology and Geometry (Graduate Texts in Mathematics), Springer; 1st edition (October 17, 1997). ISBN 0-387-97926-3. Fulton, William（英語版）, Algebraic Topology, (Graduate Texts in Mathematics), Springer; 1st edition (September 5, 1997). ISBN 0-387-94327-7. Lipschutz, Seymour; Schaum's Outline of General Topology, McGraw-Hill; 1st edition (June 1, 1968). ISBN 0-07-037988-2. Munkres, James（英語版）; Topology, Prentice Hall; 2nd edition (December 28, 1999). ISBN 0-13-181629-2. Runde, Volker; A Taste of Topology (Universitext), Springer; 1st edition (July 6, 2005). ISBN 0-387-25790-X. Steen, Lynn A.（英語版） and Seebach, J. Arthur Jr.; Counterexamples in Topology, Holt, Rinehart and Winston (1970). ISBN 0-03-079485-4. Willard, Stephen (2004). 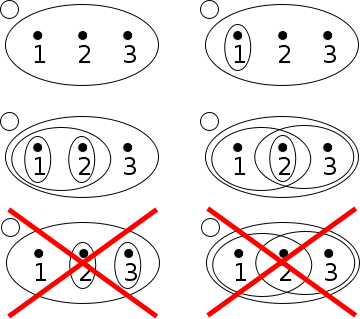 General Topology. Dover Publications. ISBN 0-486-43479-6. Weisstein, Eric W. "topological space". MathWorld（英語）.